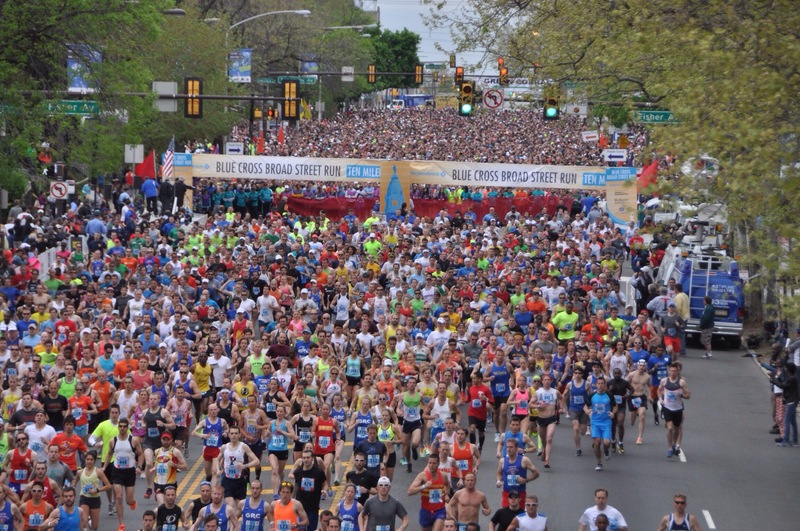 The Broad Street Run is the last of the classic Philadelphia races. 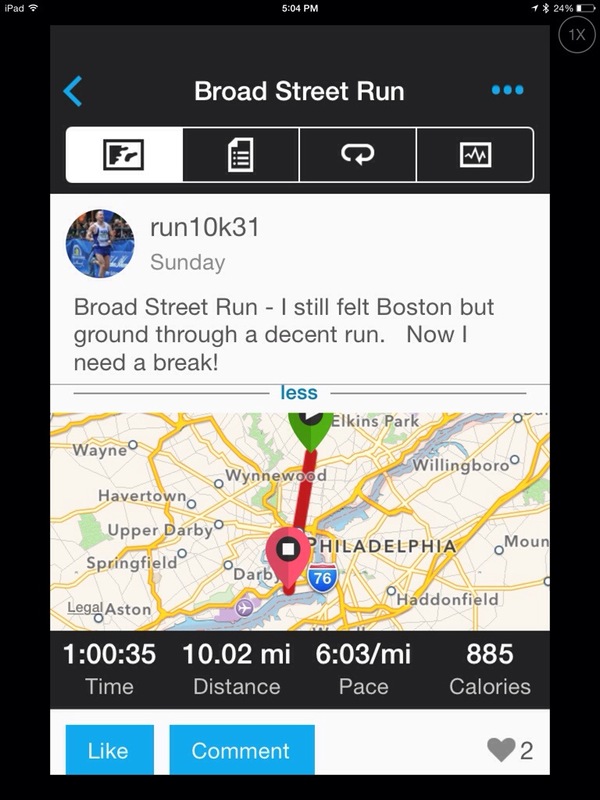 It is a 10 mile race that runs, as the name indicates, straight down Broad Street. 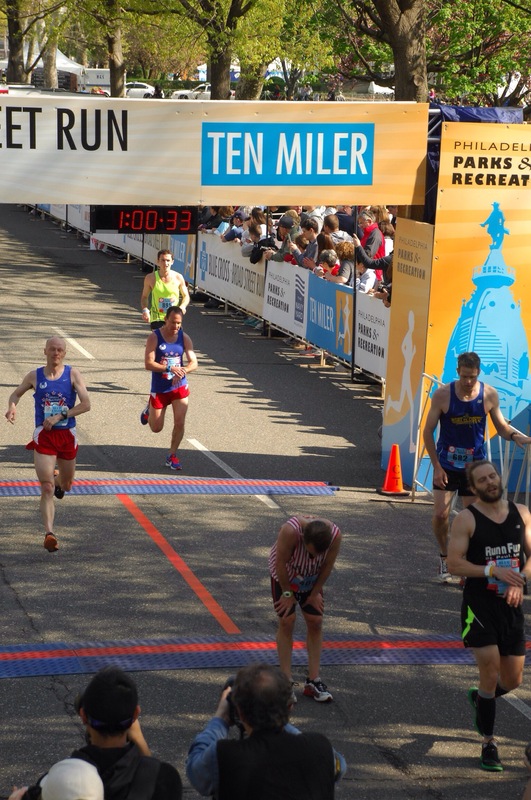 It has also become the biggest race in Philadelphia with over 40,000 runners thus making it a bucket list race for many. With such a large field this race does have a crazy start. The start area is seeded by time but even so it is nuts as this course was first run was less than 1,000 runners 35 years ago. The folks that day could not have imagined a start that looks like the photo below. If you look closely in the image you can see me, Bill Gould and Andy Cherry all together near the from of the pack just left of the center. Going into this race my expectations were quite low. I had just run Boston 13 days earlier and quite frankly was not only tired physically but really not all the psyched to be racing again so soon. My original plan was to try and hang with Bill Gould but as he was shooting for sub 57 I thought the better of that. I knew that was not in me. I have not trained to run that fast as my marathon pace was no where near that. I decided if I broke 60 that would be a solid effort considering everything. I met up with the Bucks County Road Runners crew at our meet up location at Lowe’s at 5:15am and we were headed to the finish by 5:30am. That is how this races works. 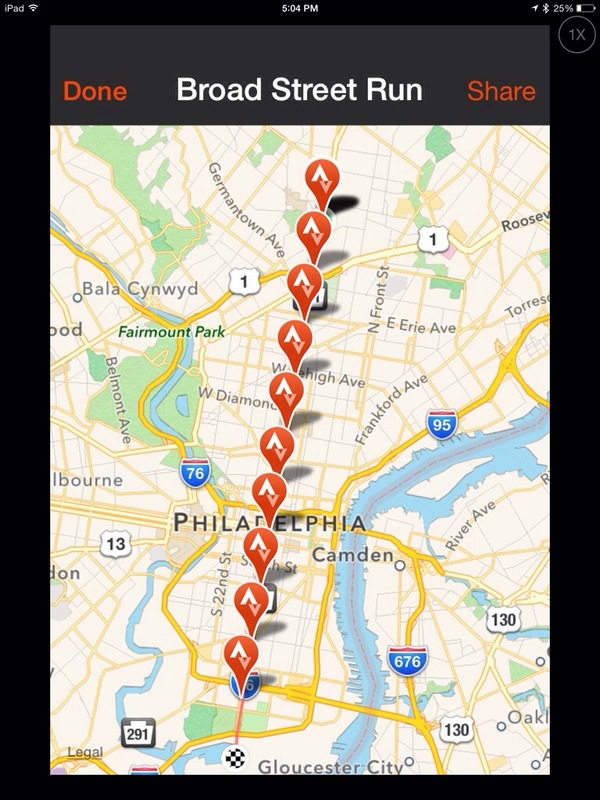 Park at the finish, take the subway (Broad Street Line) to the start. We got to our parking area early and they have shuttles from the parking are in FDR park (where BCRR has the post race tailgate) to the subway station. As we get on the shuttle bus I see my brother-in -law Alan and my niece Ari! How cool was that. So we took the subway together to the start where Bill Gould and I headed for the elite tent. I spent much of the pre race time with Bill as we both had seeded bibs. This helped with all the craziness. It gave us a place to put our stuff and a much lest crowded porta potty area which was reserved. I guess there are benefits to getting older! After warming up with Bill Gould we both headed to the start area where I saw teammates Joe Warwick, Neill Clark and my old running pal Andy Cherry. Andy have seen each other at the start of this race for well over 20 years. We usually finish close to one another alternating over the years as to who wins. I asked Andy what he was looking to run as he was hoping to break 60 as well so we decided to run together. After the gun went off we were able to find a decent pace and run together. Bill Gould went out faster and we ran 5:45 for mile one. It felt easy as there is a good downhill in mile one but we both new we were not going to hold 5:45 pace. Joe Warwick was with us as well but as Joe has not been training I could tell he was working to hold pace. He didn’t look like the Joe Warwick from last year for sure. Joe started falling back and by mile two Andy and I were together and Bill was pulling away with Joe falling back. By mile three I knew I was not going to have a great day. If felt like a strong head wind (it was more on that later) and Andy slowly began to pull away. By mile 5 Andy was 11 seconds ahead and I could not see Bill. The strange thing though is that I actually felt I was in a better position than last year despite running about the same pace. I felt strong but was surprised to be running just over 6 min pace. By mile 8 I noticed I was staying with Andy’s pace was started to pass back people who had passed me a full miles earlier. By mile 9 I knew I was catching Andy and I saw Bill up ahead. 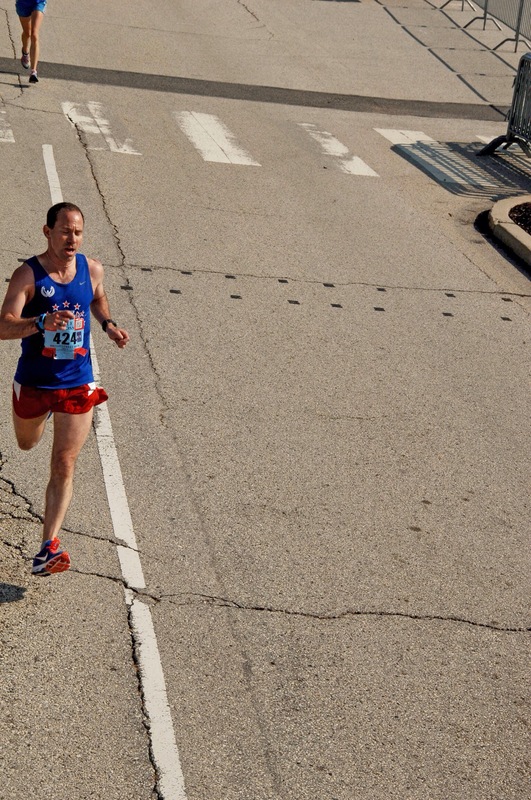 At first I was not sure it was Bill but by mile 9 I was fairly certain it was him. By 9.5 miles I was ready to pass Bill and had made up ground on Andy. I pulled past Bill and was running strong but just did not have another gear. Bill kicked past me right at the tape and Andy ended up 5 seconds ahead. It is amazing how you can see the three of us basically together in that crazy start photo and then again at the finish. Overall not a great race as I did not break an hour but the field was significantly slower than the past few years. This was likely due to the headwind. I looked up and saw the 50th runner (and 50th female) were about 1 minute slower than last year and the previous year. This seems in line with the lower times winning age group awards. In the 45-49 Andy was third, Bill was 4th and I was 5th. 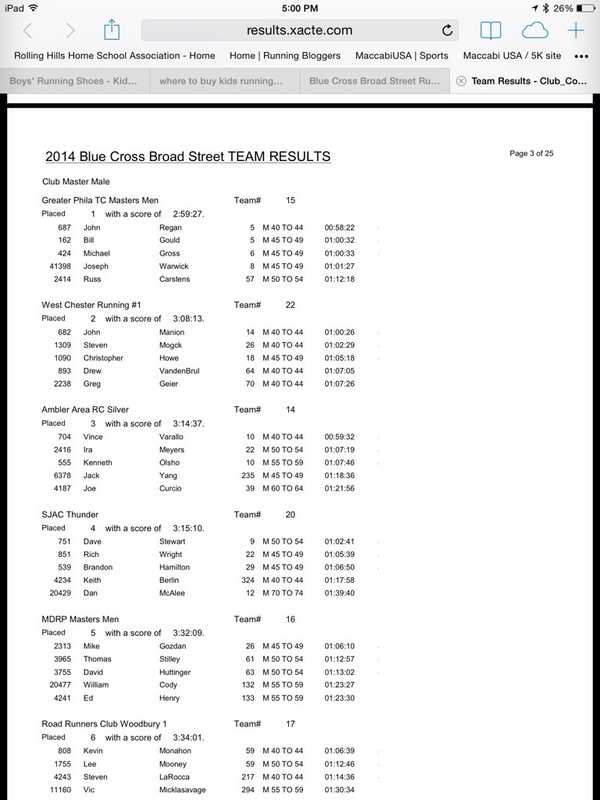 Bill and I were both on the winning Masters Club team as well running for the Greater Philadelphia Track Club (GPTC). This is the third year in a row we have been on this team and the third year we have won! So again, not the best race but not the worst either. Now a time for a break from racing! 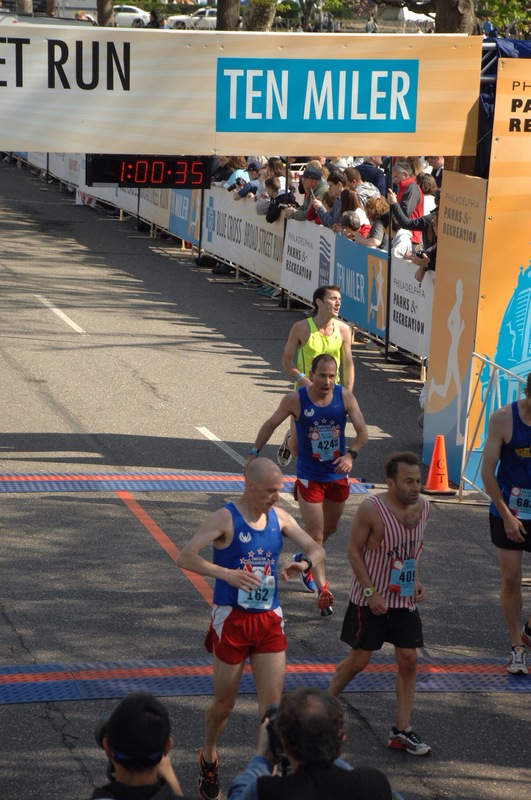 ← The 2014 Boston Marathon!